Ultrabooks are a powerful device that tablets won't be blasting out of the water for a while yet. The sleek and slender designs are favoured by consumers and businesses alike, and that's before their powerful productivity they bring to the table is even taken into account. The advantages Intel Ultrabooks bring to businesses are far reaching and outlined by the headings below. Professionals that are looking to carry out tasks whilst on the move are going to want a device that isn't big and can be used when crammed into the middle seat of the train home to the suburbs. Intel has a strict set of guidelines governing its Ultrabooks that state they must be "ultra-sleek" and "ultra-responsive". According to those terms a 13.3-inch laptop can have a maximum thickness of 18mm and those above 14-inches can be no thicker than 21mm. The battery must last for longer than five hours, the processor has to be an Intel Core one and the boot time from sleep or hibernation can be no more than seven seconds. Cloud usage in the business sector is increasingly being adopted and buying an Intel Ultrabook will allow employees to take advantage of securely stored files whilst on the move. Combining a Dell Intel Ultrabook with the latest version of Microsoft Windows gives an organisation access to cloud services, such as Skydrive, that make it easy for employees to have immediate access to documents and get to work as quickly as possible. A secure cloud service also allows any issues to be diagnosed and fixed before they cause problems that are detrimental to the company as a whole. 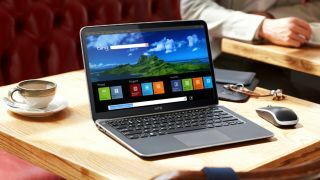 All Dell Intel Ultrabooks that are geared towards businesses also include Intel's vPro extension that allows businesses to remotely delete data from a laptop using a remote hard drive wipe that again uses the cloud. Dell Intel Ultrabooks are heavily customisable depending on what each business requires in terms of security and the laptops work together with Windows to give protection against malware and viruses like never before. Dell's range of Intel Ultrabooks offer an increasing number of options when it comes to extra security features that include fingerprint recognition and using a smart-card to log on to a device and thus means every business is catered for. One of the most important aspects of any Ultrabook is the ability to allow employees to perform a variety of tasks without the device losing any performance. Dell Intel Ultrabook laptops are fully customisable when it comes to processor power with the Intel i3, i5, or i7 available depending on the organisation's needs as well as a variety of speeds. The latest version of Windows, 8.1, also adds further multi-tasking through allowing multiple different applications to be displayed neatly on the screen at any one time – a must for doing business on the go. Intel Ultrabooks by their very nature are both thin enough and pack a hefty amount power with Intel's own guidelines for the devices making sure this is the case. The fact they have all this power packed inside and a Microsoft Windows OS that is more secure than ever means that professionals on the go are opting for Intel Ultrabooks as the weapon of choice in the business sector.